Aragorn is tempted by the One Ring. Sean Penn’s debut as writer and director is a sensitive, meditative drama anchored by strong performances from David Morse and Viggo Mortensen as a pair of brothers. The interplay between them has such an authentic feel to it. Penn’s direction is dynamic, bringing a sense of heightened tension and drama to the somewhat depressing material. I believe this is the only film I’ve seen that’s based on a song: Bruce Springsteen’s Highway Patrolman, which I’ve now listened to and found quite beautiful and moving (particularly after watching the movie). Incidentally, the musical choices in the movie are excellent. A couple of odd aspects: Valeria Golino, who I always thought of as French (probably because of Hot Shots and Hot Shots: Part Deux) but who is actually Italian (and part Greek), plays a Mexican for some reason; and the kid who plays Morse and Golino’s little son is super cute but doesn’t seem to age despite the movie taking place over at least nine months. Look for a young Benicio Del Toro in a very minor role. Overall, I highly recommend this movie. It raises some interesting questions about goodness, commitment, obligation and the bonds of brotherhood, and leaves you pondering whether you’re a hero or an outlaw; strong or weak; and most importantly, a bear or a message. This entry was posted in 1991, 8.5, Reviews and tagged Benicio Del Toro, Bruce Springsteen, David Morse, Dennis Hopper, Drama, Film, Hot Shots, Hot Shots: Part Deux, Movie Reviews, Movies, Patricia Arquette, Sean Penn, The Indian Runner, The Lord of the Rings, Valeria Golino, Viggo Mortensen on May 7, 2014 by moviesandbacon. 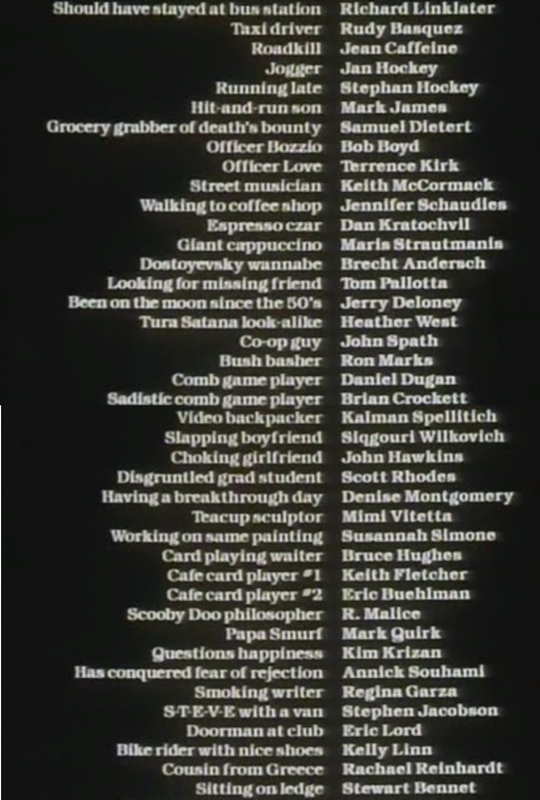 Surely no other movie has ever featured characters listed in the credits as “Grocery grabber of death’s bounty”, “Sadistic comb game player” or “Scooby Doo philosopher”. Unique debut from Richard Linklater aimlessly follows a ragtag bunch of mostly unconnected misfit characters in Austin, Texas as they aimlessly go about their day, mostly spouting garbage. It’s memorable, ambitious, and conveys the sense that we’re seeing an authentic slice of the fringe of American society, but for me it didn’t really work as a movie; I think I need at least some semblance of a narrative, and there’s none at all here. The deliberate refusal to stick with any individual character for any substantial length of time also makes it hard to stay interested. Still, the quirkiness – of pretty much all characters, plus the movie itself – has a certain appeal. 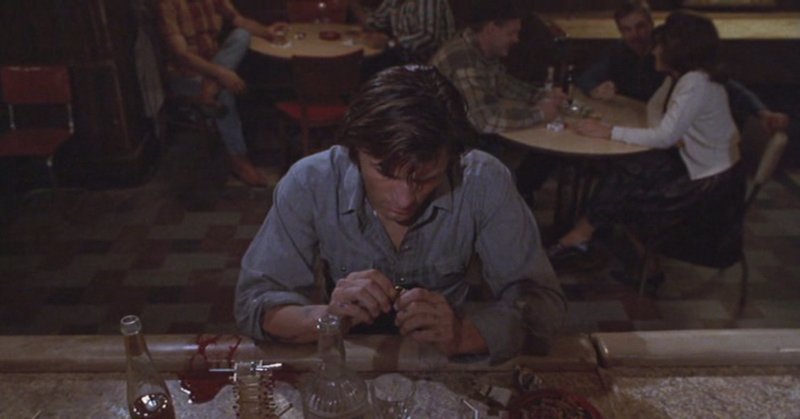 It’s also fun to see Linklater himself at the start. This entry was posted in 1991, 4.5, Reviews and tagged Film, Indie, Movie Reviews, Movies, Richard Linklater, Slacker on March 5, 2014 by moviesandbacon. Hmmm, nine cars chasing one across a plain… remind anyone else of the Arwen/Nazgul horse chase scene in The Lord of the Rings: The Fellowship of the Ring? The similarity is really quite uncanny. This really isn’t the kind of movie that comes to mind when I think of Ridley Scott, but regardless of its dissimilarity from his usual fare, he does a sterling job with the material. It’s long, almost languid at times, giving us plenty of time to get to know and love Geena Davis’ Thelma and Susan Sarandon’s Louise. Both actresses are in top form, as are many members of the supporting cast: Harvey Keitel, Michael Madsen, Christopher McDonald, the great Stephen Tobolowsky, and especially Brad Pitt in his breakout role. Thanks to them and the fine script, it’s funny, touching and quite moving. It’s also beautifully shot, with scenery that gets more and more picturesque as our heroines drive closer to their doom. The soundtrack’s good too, full of boppy tunes that help get the tone right. And that ending! I just wish I hadn’t known about it in advance. This entry was posted in 1991, 8, Reviews and tagged Film, Movie Reviews, Movies on January 21, 2014 by moviesandbacon. Spare a thought for this innocent teddy bear that gets caught up in the mayhem. One of those remakes that takes the ‘bigger is better’ approach and consequently fails. Scorsese exhibits skill as a filmmaker, as he always does, but it’s all for nought. There are several reasons for this: there’s no proper suspense or sense of reality; things that are supposed to be scary or creepy are instead silly or muddled; the attempt to delve more deeply into the story’s underlying themes (mostly by making the protagonist less heroic and his family dysfunctional) doesn’t pay off; the unusual stylistic flourishes, such as occasionally flashing to negative film images, add precisely nothing; and Robert De Niro ruins every scene he’s in. I was shocked to discover De Niro was nominated for an Oscar for his performance, since I found his laughably bad Southern accent almost as distracting as his unfortunate overacting. On the bright side, it’s nice to see the stars of the 1962 version appear in cameos that play against their original roles, though it does have the effect of bringing that far superior movie to mind, and the comparison does Scorsese no favours. (In my case, watching this version immediately after the original made the comparison even more stark and certainly contributed to my distaste.) My least favourite Scorsese film. This entry was posted in 1991, 3.5, Reviews and tagged Film, Movie Reviews, Movies on January 5, 2014 by moviesandbacon. I went into this knowing almost nothing about it and came out with a considerably lower opinion of Gus Van Sant than I’d started with. River Phoenix is fine and Keanu Reeves less a liability than he could have been, but it’s self-indulgent and just not very interesting. The attempt at Shakespearean parallels doesn’t work. This entry was posted in 1991, 3, Reviews and tagged Film, Movie Reviews, Movies on January 5, 2014 by moviesandbacon. 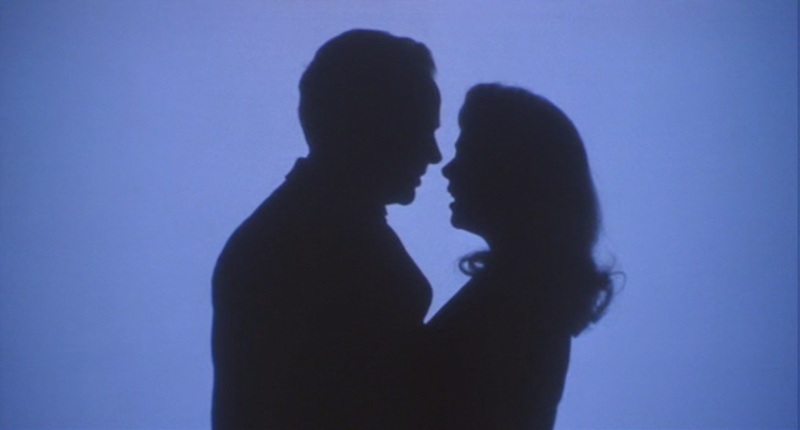 For a moment I wondered whether the entire movie could have been done in silhouette. Then, when I considered how few rabbits and dogs were in it, I thought better of it. I’m partial to mob movies but Barry Levinson’s biopic of Bugsy Siegel was a disappointment to me. A nice production with convincing period detail, it’s quite old-fashioned in its approach to the material and to storytelling. Levinson’s basically a nostalgia expert and I don’t think he was the right director for this story. Warren Beatty, who I’m quite a fan of, is fairly unsubtle in the title role. I also never fully bought into Annette Bening’s character or her relationship with Bugsy – and that was a fairly central thread running through the movie. Harvey Keitel’s portrayal of Mickey Cohen is quite different to Sean Penn’s scenery-chewing version in Gangster Squad, though I don’t think he deserved the Oscar nomination he received for it. Entirely unremarkable score from Ennio Morricone. The language nerd in me enjoyed the part where Bugsy corrects Jack Dragna’s use of the word ‘disinterested’: “Uninterested. Disinterested means impartial. Uninterested means not interested”. This entry was posted in 1991, 6, Reviews and tagged Film, Movie Reviews, Movies on January 5, 2014 by moviesandbacon.